For the band, see The Brilliant Corners. The album was recorded in three sessions in late 1956 with two different quintets. "Ba-lue Bolivar Ba-lues-Are" and "Pannonica", on which Monk played the celeste, were recorded on October 9 with saxophonists Ernie Henry and Sonny Rollins, bassist Oscar Pettiford, and drummer Max Roach. The former composition was titled as a phonetic rendering of Monk's exaggerated pronunciation of "Blue Bolivar Blues", which referred to the Hotel Bolívar where Pannonica de Koenigswarter resided; Monk had met her during his first trip to Europe in 1954. 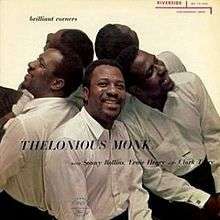 On October 15, Monk attempted to record the title track with the same band during a four-hour session. The complexity of the title track became a challenge for Monk's sidemen, who attempted twenty-five takes, and led to tension between him and Henry, who nearly broke down mentally, and Pettiford, who exchanged harsh words with Monk during the session. Monk tried to make it easier on Henry by not playing during his alto solo. During one of the takes, producer Orrin Keepnews and others in the control room could not hear Pettiford's playing and checked his bass microphone for a malfunction, but ultimately realized that he was pantomiming his playing. Without a completed single take, Keepnews ultimately pieced together the album version from multiple takes. On December 7, "Bemsha Swing" was recorded with Paul Chambers on bass and trumpeter Clark Terry, who replaced Henry, and Monk recorded a solo piano version of "I Surrender, Dear". The title track has an unconventional song structure that deviates from both standard song form and blues structures, as well as from Monk's African-American music roots. Its ternary form employs an eight-bar A section, followed by a seven-bar B section, and a modified seven-bar A section, and features a double-time theme in each second chorus and complex rhythmic accents. According to Down Beat magazine, Brilliant Corners was the most critically acclaimed album of 1957. Nat Hentoff, the magazine's editor, gave it five stars in a contemporary review and called it "Riverside's most important modern jazz LP to date." Jazz writer David H. Rosenthal later called it a "classic" hard bop session. Music critic Robert Christgau said that, along with his 1959 live album Misterioso, Brilliant Corners represents Monk's artistic peak. In his five-star review of the album, Allmusic's Lindsay Planer wrote that it "may well be considered the alpha and omega of post-World War II American jazz. No serious jazz collection should be without it." In 2003, Brilliant Corners was one of fifty recordings chosen that year by the Library of Congress to be added to the National Recording Registry. It has also been included in the reference book 1001 Albums You Must Hear Before You Die, with reviewer Andrew Gilbert saying it "marked Monk's return as composer of the first order." Because of its historical significance the album was inducted into the Grammy Hall of Fame in 1999. Thelonious Monk – piano; celeste on "Pannonica"
Ernie Henry – alto saxophone on "Brilliant Corners", "Ba-lue Bolivar Ba-lues-are" and "Pannonica"
Oscar Pettiford – double bass on "Brilliant Corners", "Ba-lue Bolivar Ba-lues-are" and "Pannonica"
Max Roach – drums; timpani on "Bemsha Swing"
Clark Terry – trumpet on "Bemsha Swing"
Paul Chambers – double bass on "Bemsha Swing"
1 2 3 4 5 6 Mathieson 2012, p. 176. ↑ Mathieson 2012, p. 177. ↑ "Thelonius Monk: Brilliant Corners – 1957's most praised LP". Down Beat. Chicago. 24 (21-26): 27. December 12, 1957. ↑ van der Bliek et al. 2001, p. 89. ↑ Rosenthal 1993, p. 132. ↑ Christgau, Robert (December 13, 2009). "Not So Misterioso". The Barnes & Noble Review. Archived from the original on April 12, 2013. Retrieved April 12, 2013. ↑ Planer, Lindsay. "Brilliant Corners – Thelonious Monk". Allmusic. Retrieved July 29, 2013. ↑ Dimery, Robert (2009). 1001 Albums You Must Hear Before You Die. Octopus Publishing Group, London. p. 32. ISBN 9781844036240. Retrieved 2012-09-23. Mathieson, Kenny (2012). Giant Steps: Bebop And The Creators Of Modern Jazz, 1945–65. Canongate Books. ISBN 0857866176. Rosenthal, David H. (1993). Hard Bop: Jazz and Black Music, 1955–1965. Oxford University Press. ISBN 0195358996. Retrieved July 29, 2013.
van der Bliek, Rob, ed. (2001). "Brilliant Corners and Riverside". The Thelonious Monk Reader. Oxford University Press. ISBN 0199761477. Retrieved July 29, 2013. Fordham, John (August 30, 2011). "My favourite album: Brilliant Corners by Thelonious Monk". guardian.co.uk. Guardian News and Media Limited.